Group run, Jason and I went ahead. Got a bit off trail, but a good run. Cool days- feeling good. Hope to peak at the right time... if you can peak during recovery :) Soon... very soon..
Nice day for a run, mid 50's, last day with any 'speed' WU 8:32, 7:56, 7:18, 7:24, 7:20, 7:18, CD 7:30 Then a mile with Aly as she gets read for her first 5K. Heading out tomorrow am! Long drive, just going half way and getting in Saturday. A few friends from work got me a super cool 'Boston or Bust' basket and card. Full of runner food (and reeces cups ;) , magazines and just awesome of them. We decided to make the trip to Boston a two day affair and get a room in NY about 4 hours away. This was so we could surprise the girls with a stop off at Niagara Falls. They had no clue we were going and even after seeing some signs saying the falls were the ‘same direction’ figured there was no way we were stopping since we were clear that we would do some sight seeing in Boston while I was there to run. They really enjoyed that stop and took many a picture. My oldest daughter graduates this year (time… it just vanishes) and she is very much into photography. She is very good with Photoshop and is helping do wedding pictures this fall. Maybe I will post some Falls pics with race ones she took. So what about the younger? Well the way into Boston Saturday was the stop at the American Doll shop. Yes, I was patient with many other dads and then off to the hotel. The Marriott downtown was nice, but wow is the cost of everything in Boston high. I actually booked a hotel out of town, but mom had a surprise call and helped us get a room down town. Very cool. Monday was the moment. I knew it was a long road back from injury (or at least it seemed so) but going into the weekend I thought I had a shot at a PR if we had a tailwind. Then the heat forecast came out. Then it kept getting worse. I am sure everyone is well aware of the heat – that was the topic of the marathon. So the plan? Start out strong, but controlled, if the heat did not bother me I would go for it, if not just enjoy the ride. Miles 1-2 7:39, 7:37 I felt really good. Paces right were I wanted them with almost no effort, ready to kick it down if I kept feeling this way. I was also very loose and keeping it ‘light’ with the runners around me. Mile 3. 7:53 This is where I actually felt the heat a bit. I figured I still wanted a good race, but I better back it off for the next several miles and see how she went. The mood was still light and fun though and I took the time to high 5 all the little kids out there. Mile 4. 7:50 This was not on the ‘things to see’ in Boston. So we all know people have to ‘go’ at moments there are no available bathrooms. Usually not a problem as people run off the course a bit and take care of needs. So less that a few feet off the course a lady decided she had to go and dropped it all. A full moon was not on my list for Boston, but we sure got it. Seriously? Miles 5-6 7:59, 7:47 The miles were not peeling off anymore.. It was certainly warm, but manageable I thought. I still was joking around, but I noticed others were starting to labor. It was awfully early in the race for so many people around me to be working this hard. Mile 8. 8:10 I staggered back my pace some. I was feeling it a bit and did not want to crash. I marked this as the ‘let’s forget the Garmin and soak in the event’ mile. Mile 9-11 8:26, 8:07, 8:42 Some up and downs as Boston is full of, but I was enjoying the people and fun times here. The families with sprinklers, a guy racing as ‘Waldo’ and kids with squirt guns abound! The support was second to none. Mile 12-13. 8:29, 8:25 Wellesley. They did not disappoint. I was happy to see a Republican, a Baseball Fan and a Time Lord in the mix. Mile 14. 8:26 Halfway , I felt okay, but the heat was even affecting even my sense of humor. I still went out of my way high 5 kids, but I was very happy to see the fire department open some hydrants. Mile 15-16 8:35, 8:36 Mellow miles, convincing myself that the good news is the humidity was low. Oh and another big fat sign telling us it was hot and to hydrate. Thanks. Mile 17 9:06 bathroom stop. Every marathon so far I have one and just one potty break. This killed me. Why? That porta potty. Sure I was only in there for 20 seconds, but the temperature in that thing was at least 20 degrees warmer. For the first time, I felt sick from the heat. I got back on the road and trotted for a few. Mile 18 9:27 The first half mile here I was trotting trying to get that sick feeling to pass. Mile 19-20 8:46, 9:17 I started to feel better after getting sprayed off and more fluids, but I am not sure I ever was 100% back after that stop. Mile 21 9:37 Paul said Heatbreak Hill was for tourists… well on this day, I was a tourist. The heat made that more difficult that it should have been. Mile 22-23 8:43 The down hills following. I walked as I drank my cups of water/Gatorade here on out. Mile 23-24 9:15, 9:11 The crowd was great through out, but as we got to these last 4 miles it was incredible support. Here is where high 5’ing the kids cost me. I saw some little ones and made sure I got them… well then there was a wall of them so I kept going. I swear there was over a half mile of kids to high 5 and I got them all. I was beat after that all joking aside. I could not wait to grab some water. Mile 25 9:39 I was getting my ‘almost done’ feeling when I saw these very cool flaming shorts. I though, hey a guy on our blog wears shorts like that. As I went to pass him I was like… wait… that is Mike (rt). He did not look well, I stopped and introduced myself but I am still not sure he knew who the heck I was. He told me he did not wear the matching shirt, but the heat was brutal. I told him I was the idiot who wore all black. Mile 26 9:25 The family was yelling at shouting, it was funny because they were between a family from Canada and a family from Mexico who helped them yell. They were afraid I would not see them in the crowd and honestly in my daze I am glad they got some help shouting. I stopped for a second to hug the girls and finish up. Mile .2 7:58 (pace) That gave me to break I needed to finish up running stronger. Horrible heat, but would I do it again? You bet I would. 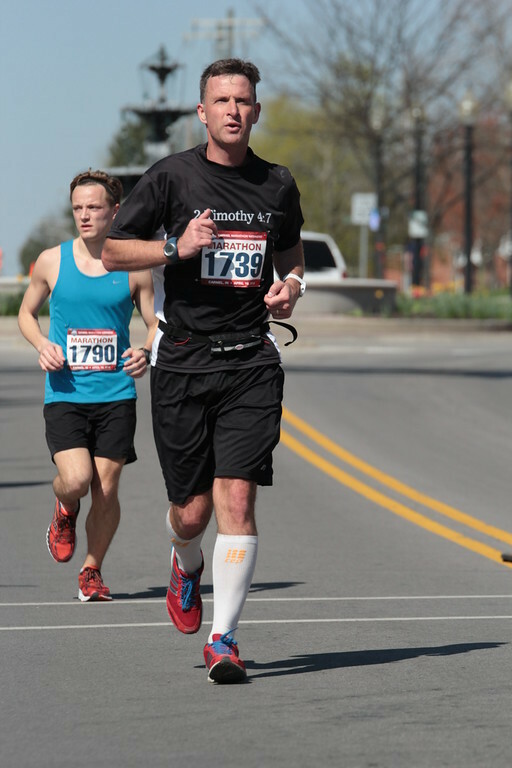 I know this was not a great event for many and I am now pretty positive I could have finished at least 35-30 minutes faster on a cool day, but I don’t care really, it does not make it a bad marathon. I honestly enjoyed the experience. That night we walked all over and yes I wore the medal. The people were really nice and supportive. I enjoyed the Commons and Gardens. That night I woke up twice breaking a fever. After a little research - could have been slight dehydration, but who knows. I feel fine nowJ. Anyone who read all of that… sorry! And sorry x2 as I typing this on the road… who knows the errors it may contain! First Post Boston run. 48... ahhhhh.... 48 lovely degrees. Easy, slow, but felt very good after. I am looking forward to a quicker than normal recovery. 54 morning run. Everything feels lovely after Monday! My quad seems actually better after Boston than before. I think that is a great sign. I hope to get fully heal and really hit this summer hard. Today my 11 year old ran her first 5K. It was part of a street festival. Our church has a parade we are apart of and we run the 5K before. She really did not prepare fully for it, but I have been making time to run with her all the same. I was not sure she really could run the whole thing since she never made it 3 miles (at once) in our running together. So we made it out on a little chilly morning (40)with some cold drizzle to boot. I am thrilled to say I paced her all the way start to finish and she never gave up! She ran the whole distance and I was one very proud dad. Un-importantly she was 7th (of 14) in her age group. She was very excited about this and now claims she is going to run every day and see what she can accomplish. (I believe the awards the others got was motivation). I would love it if she keeps with it from this age, but even if she doesn't this has been a great day! Cool morning, 35, with a cold wind. Actually put a hood over my head, what a difference a week makes. Easy miles with a 20-30s pick up every mile. No watch. Feels good. Nice afternoon run, 55 and smiling. Ran 3 threshold miles to get myself loose again. My hip is a tad sore this evening, but nothing horrible. Wow hip pain = old people talk. Long day of work tomorrow,need a good run, hopefully early. Busy day all around so shortly after dinner I wanted a nice casual run. I figured a few miles easy. I felt fine and pace picked up kinda on its own. Decided to run it in faster (6:55) as the sun went down. Pressed for time a bit today. My oldest daughter went on her senior trip to Gatlinburg. I'm sure she will have a great time. Slow miles today. Crisp 5am run, 43 degrees. 7+ mile warm up, then 12x400 with/60s recoveries. I really want to have a strong summer of training since my daily runs have felt fine. I now have some quad pain, so let's hope it's my body just getting used to some tougher training. 8 recovery type speed miles. 78 during the run, temp swings like crazy. A little soreness in the quad and if it doesn't get any worse it should be a great training season. Big day of work tomorrow,hope it goes well!